Is the Youth of Today Necessarily “Modern Man”? Looking for More from the Colloquium? Most places which use the Roman Rite keep today as the feast of St Ignatius of Loyola, the founder of the Jesuits, who died on July 31, 1556. But in the Middle Ages, July 31st was kept in France, England and some other places (although not at Rome) as the feast of St Germanus of Auxerre; Ignatius himself would have celebrated this feast during his years as a student in Paris, along with the earliest members of the Company. A 7th-century church dedicated to St Germanus sits directly in front of the Louvre; his feast is also on the calendars of liturgical books of the medieval French and English Uses. Although devotion to him is not as widespread now, St Germanus may well be described as the St Ambrose of the fifth century. Like the great archbishop of Milan, he came from a family of high rank, and after studying law in Rome, served as the civil governor of a Roman province. Like St Ambrose, when the bishop of his provincial capital died, he was chosen to succeed him by popular acclamation, and embraced his new state of life completely; and in that role, he revealed himself as fierce an opponent of the 5th century’s dominant heresy, Pelagianism, as St Ambrose had been to Arianism in the 4th. Pelagius himself was a Briton, and in the early 5th century his heresy was flourishing in his native place. 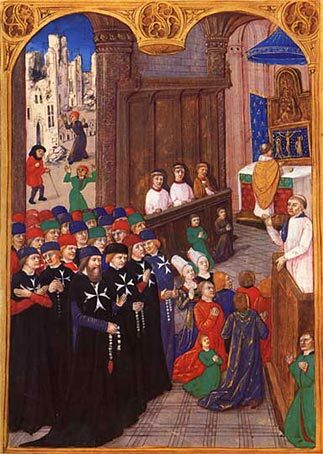 In 429 Pope St Celestine I and the bishops of Gaul sent Germanus, accompanied by St Lupus of Troyes, to Britain, to combat the heresy; they reduced Pelagius’ followers to silence not only by their overwhelming success in a public debate, but also by their example of holiness and various miracles. St Germanus’ triumph would be capped by a second visit to Britain in 440 to stop a new outbreak of the heresy, after which, (as St Bede will note with pride in the 8th century), Britain remained true to the Catholic Faith until the Reformation. The great Catholic writer and apologist Hilaire Belloc, who was French on his father’s side and English on his mother’s, wrote a very funny drinking song in honor of St Germanus and his defeat of the Pelagian heresy; it is included in his novel “The Four Men – A Farrago”, first published in 1911. It was your own affair. But was your own affair. He put no faith therein! And he laughed at Original Sin. He laughed at original sin. And he called Pelagius shame. They rather had been hanged. Would smother a mortal creed. 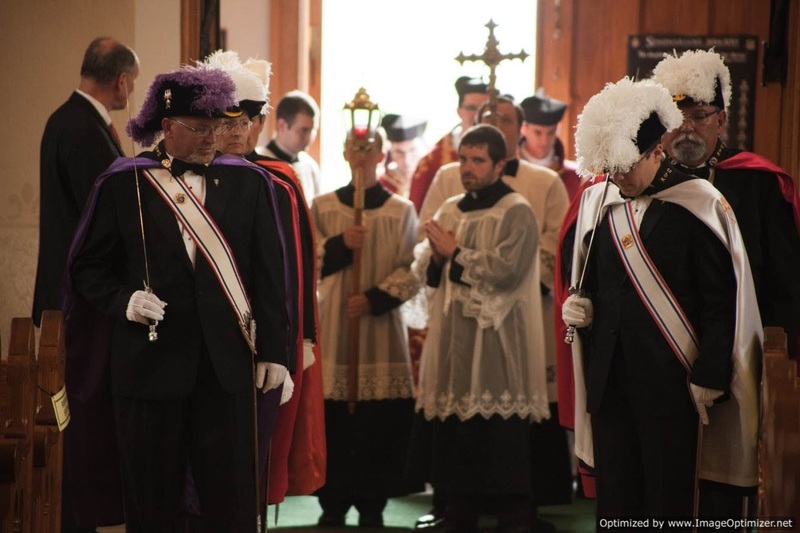 Saint Vincent Archabbey celebrated a Requiem High Mass in October last year for Br. Nathan Cochran, O.S.B., who passed away on July 30, 2014. H.I.R.H. Archduke Georg Habsburg-Lothringen of Salzburg, Austria, gave an opening address on behalf of the Habsburg Family and the Emperor Karl League of Prayers. It included words from League President, Fr. Marian Gruber, O.Cist., of Heiligenkreuz Abbey. In the video of the complete ceremony below, the homilist speaks about this concern for beauty and art in the Church. The Mass had a large attendance and was the first time a Requiem High Mass has been celebrated in the Saint Vincent Archabbey Basilica in over 50 years. Of considerable interest to NLM readers will be this newly published book from Angelico Press. I have already begun reading it and am finding it a gripping page-turner, brimming with keen insights and strong but well-grounded opinions. The treatment of Church crises (Arianism, Protestant revolt) is beautifully done and I look forward to the author's analysis of Vatican II and aftermath. I don't feel in a position to write a proper review yet, but my initial reaction is very positive. 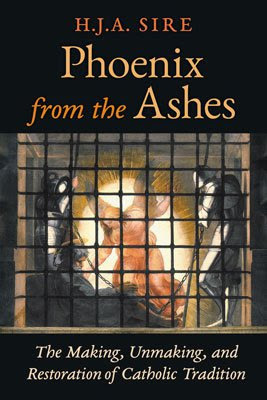 PHOENIX FROM THE ASHES is a comprehensive look at the state of the Catholic Church since the Second Vatican Council — one of a series of recurrent periods of moral and intellectual crisis to which it has succumbed in its history. A chapter on the Council describes in detail how Pope Paul VI diverted it by placing it under the exclusive control of European liberals. 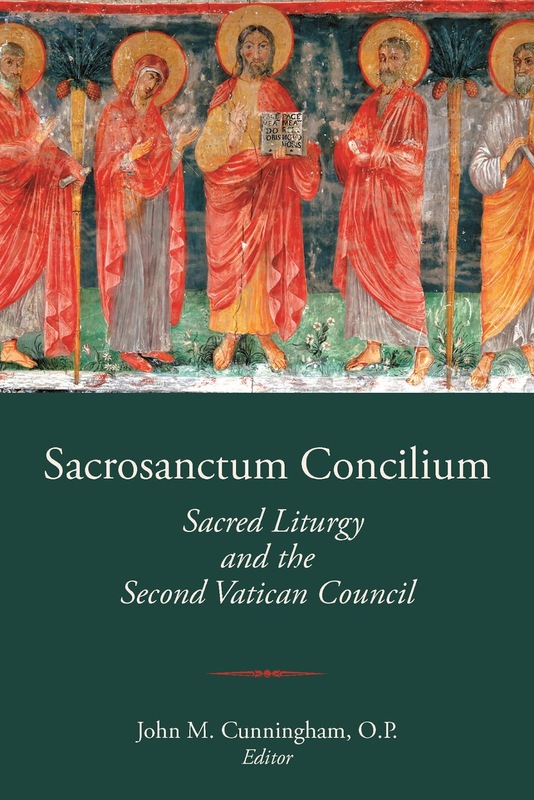 An equally close study is devoted to the liturgical “reform” entrusted by the same pope to a group of radicals whose work undermined the spiritual and devotional legacy of the faithful. 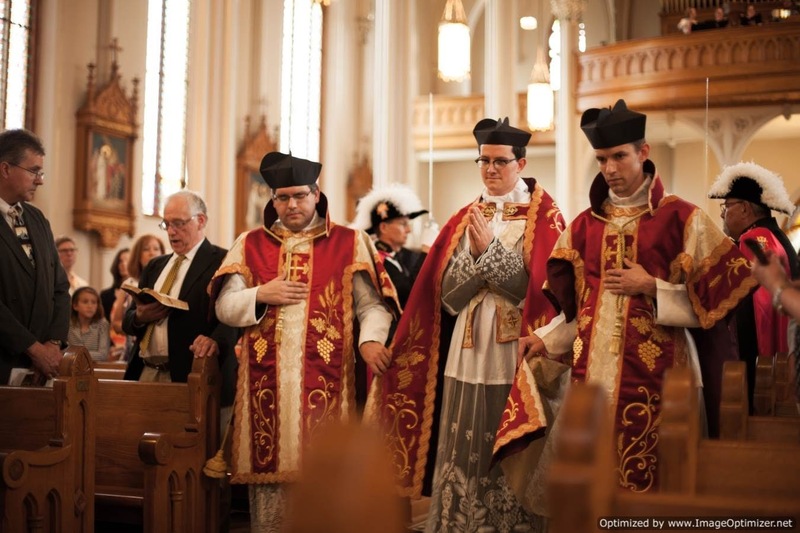 The loss of orthodox teaching and the disorientation following upon these changes produced a grave crisis in both clergy and laity, but the movement of return to tradition visible today promises a revival of the full Catholic life of the Church. 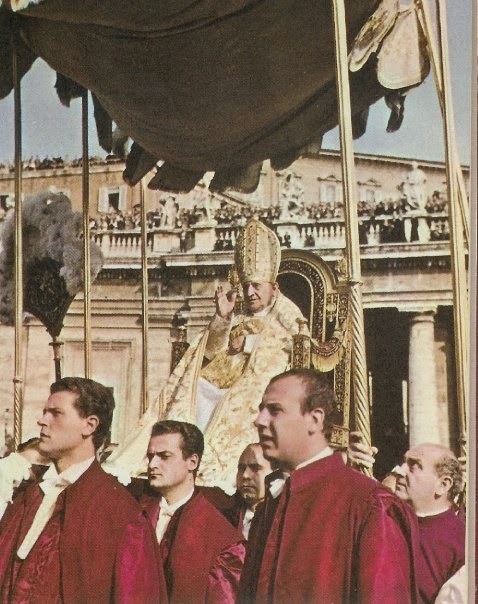 Catholic readers now have a complete and eminently accessible account of the last 50 years of momentous changes in the Church, right up to the pontificates of Benedict XVI and Francis I.
H. J. A. SIRE was born in 1949 in Barcelona of a family of French ancestry and was educated in England, at Stonyhurst College and at Exeter College, Oxford, where he took a degree in Modern History. He has written several books on subjects of Catholic history and biography and currently lives in Rome, where he works professionally as a historian. Fr Charles Byrd, pastor of Our Lady of the Mountains in Jasper, Georgia, here writes about his encounter with a man who wasn’t quite sure his church was Catholic, because the liturgy was done with some care for beauty. Our thanks to Fr Byrd for sharing this with our readers. After the 11 a.m. Sunday Mass, I was spending time greeting people beneath the porch and in the narthex. It is a time when most pastors have a hundred or more conversations with folks who wait just to say a few words. There are some regular families who always want to briefly chat. Others might want to comment on the homily, and still others might want a scapular blessed, ask for prayers or for a special blessing before they travel. The narthex after Mass can be a joyful place really. On this particular Sunday, as the crowds grew thinner, I decided it was time to make my exit and go to divest, so I turned to walk towards the vestry. From the shadows emerged a man I had never met before, who was obviously visiting for the first time, and who had evidently been waiting to speak to me last, once the crowds had cleared out. He was an older gentleman. You could tell by his stance and the diplomatic caution with which he was trying to form his question that he really didn’t want to be rude, but he needed some clarification. I could tell his heart was troubled, so I stopped to hear him out. He asked “Father, excuse me, but might I ask … is this parish under the auspices of the Holy See … that is to say the Pope?” To which I responded, “Yes sir, we are.” But he still needed further clarification “So then this parish is under the Archdiocese?” And again, I assured him, “Yes sir, we are.” He seemed relieved, and smiled, and just to make sure he said “Well, you see, Father, there are some parishes that claim to be Catholic but they really aren’t.” I nodded and assured him we were really Roman Catholic and in communion with the Pope. Evidently, our guest was trying to make sure we really were not a schismatic parish. The reason this is so ironic is because it was summer, and during ordinary time our Mass parts are ordinarily sung in English. I mean we sung a Kyrie in Greek, but the rest of the Mass was entirely in the vernacular. Looking back over the liturgy in fact, there was not even a peep of Latin in any other part of that Mass. 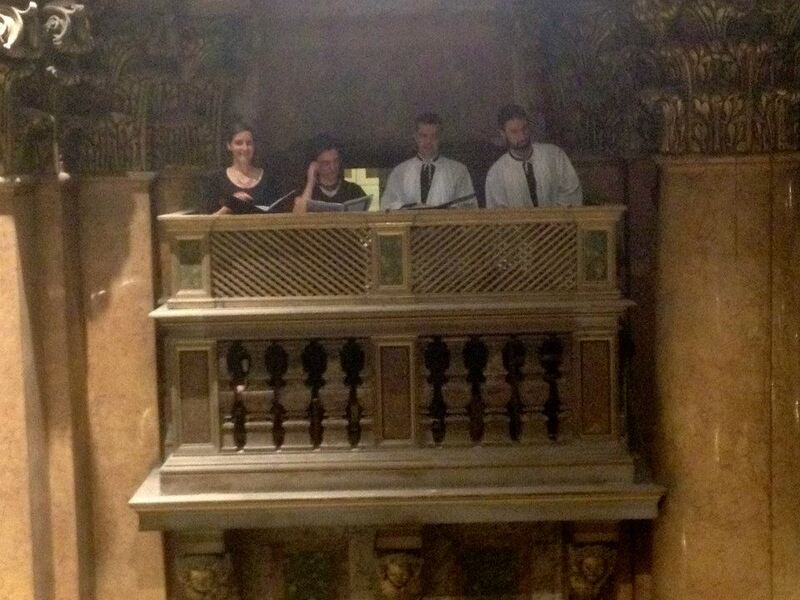 The summer break means there was no choir, and so it was a Mass with a cantor and an organist. All the proper chants were done in English. There was a hymn after communion and a hymn at the recessional, but both of these were in English too. My point is this was a congregational singing Mass … there were none of the anthems or polyphonic offerings we might hear when our choir gathers. I also recall that some of our altar servers had failed to show up that Sunday so all we had were two servers for that Mass, which is unusual for us. One was the crucifer and the other was the thurifer. Moreover, our deacon’s dear wife was not well, so we had no deacon that weekend either. Consequently the liturgy was a bit sparse for us. 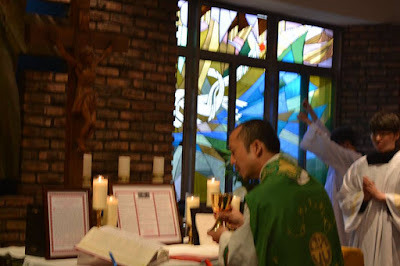 I remember that I had preached briefly on the new stained glass windows in the narthex, and that we had prayed the Roman Canon that Sunday (again, in English, and versus populum). We had prayed for the pope and bishops in the anaphora and in the prayers of the faithful, and we had prayed for the cardinals in the upcoming Synod for the Family, that they would uphold the teachings of our Founder, and yet still, this gentleman wanted to make sure that we were Catholic. This is a funny story, but it is also a sad one. You see this kind man wanted us to be Catholic, but he wasn’t sure we were Catholic because, well, we seemed to be really Catholic. I am not even sure he communicated that Sunday, so concerned was he that we might not really be Catholics (though he came back later that week for a daily Mass, and came up for Communion). Still this story demonstrates a point that needs to sink in. Our little parish does use Latin Mass parts seasonally, and our choirs will sing in Latin motets here and there, but none were heard that Sunday. Our rural parish doesn’t offer the Extraordinary Form Mass, though we might pray the Roman Canon in Latin but once a year. We routinely sing the dialogue prayers and presiding prayers on Sundays, and our cantor or choirs sing every sequence they can throughout the year, but again these are sung in English, and we almost never sing the Gospel. Our Sunday Masses are usually over within an hour, and if they go longer, it is because most folks come to the choir Mass, and those communion lines are longer (I’m sorry, but communion rails were just so much faster). The point is, our parish tries but we aren’t overly fussy about things (especially in the summer). This is not a city parish with lots of money and loads of nearby professional musicians for hire. We like to think of ourselves as poor, but classy, but we are decidedly rural and small. Nevertheless, because we are mindful of the liturgy, and because we sing the propers, and because our liturgies are noble and dignified, this confused guest presumed we must not really be Catholic. What does that say about what is going on in other parishes? I later came to find out that our guest was a Fourth Degree Knight of Columbus. He was an ordinary Catholic man who wanted nothing more than to be a good Catholic. And I have to say he was so happy to find an ordinary Catholic parish that offered the Mass with dignity. I won’t be surprised if he makes us his permanent home. As a Catholic priest, I would like to challenge other parishes to consider this story. Keep in mind that I have nothing against the Extraordinary Form of the Mass. We’re just so small and rural, and I am all alone as a priest in the county, and swamped, and I want to bring unity to my parish. So we forge ahead the best we can out here. But I get a lot of folks driving up from the suburbs looking for something different. Why? I think it is because too often in the frenetic delirium to be relevant and up-to-date, and to try to reach the masses, we Catholics may just be losing the masses. So maybe it is time we paid more attention to the Mass. Seems to me what we need is stability and sanity. Just saying. Just a great picture, from the Portuguese-language facebook page Direto da Sacristia, used with their kind permission. 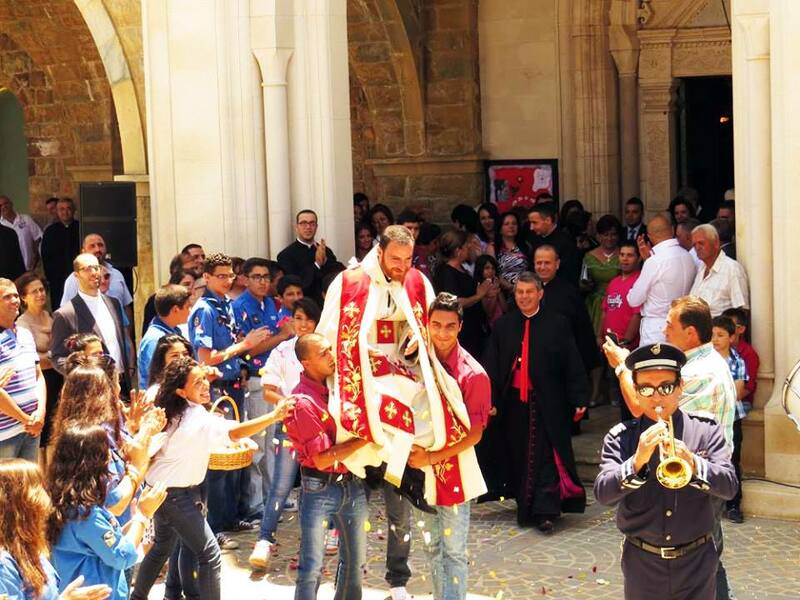 Newly ordained Fr Marc Khouryhanna, carried on the shoulders of the faithful in priestly vestments, at Zgharta, in northern Lebanon. 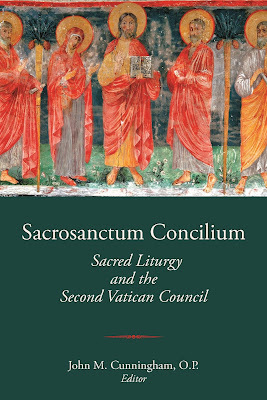 The Proceedings of the Sixth Fota International Liturgical Conference, held in 2013 to commemorate the 50th anniversary of the promulgation of Sacrosanctum Concilium, the Second Vatican Council’s constitution on the Sacred Liturgy, will be published by Smenos publications, who are offering it at a special pre-publication price through their website. (click here) The complete list of the essays is given below. Preface - John M. Cunningham, O.P. 6. Liturgical Reform and the Unity of Dogma and Prayer - Serafino M. Lanzetta, F.I. 7. Active Participation in the Renewal and Promotion of the Liturgy of Vatican Council II - Paul Gunter, O.S.B. 11. The Anaphora of the Apostles Addai and Mari and the Narrative of Institution - Robert Abeynaike, O.Cist. Today is the feast of the martyr St Christopher, who was traditionally kept as a commemoration on the feast of the Apostle St James the Greater. One of the legends about him is that his persecutors attempted to kill him in the same manner that would later befall St Sebastian, by tying him to a stake and shooting him full of arrows. In Christopher’s case, the arrows simply stopped moving when they got close to him and hung in the air around him. Arrows were taken as a symbol of the plague, and so he came to be honored as one of the many Saints whose intercession was invoked against it. The Venetian painter Lotto therefore shows him here in the company of two such other Saints. The Sarum Missal contains a series of votive Masses for Saints invoked for protection against plagues and diseases: Sebastian, Erasmus, Genevieve, Roch, Christopher, Anthony the Abbot, and the archangel Raphael. 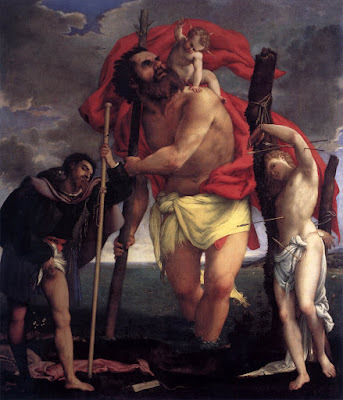 The Mass for St Christopher in this series contains this beautiful collect, which also refers to the well-known legend that he once bore the infant Jesus on his shoulders across a river. 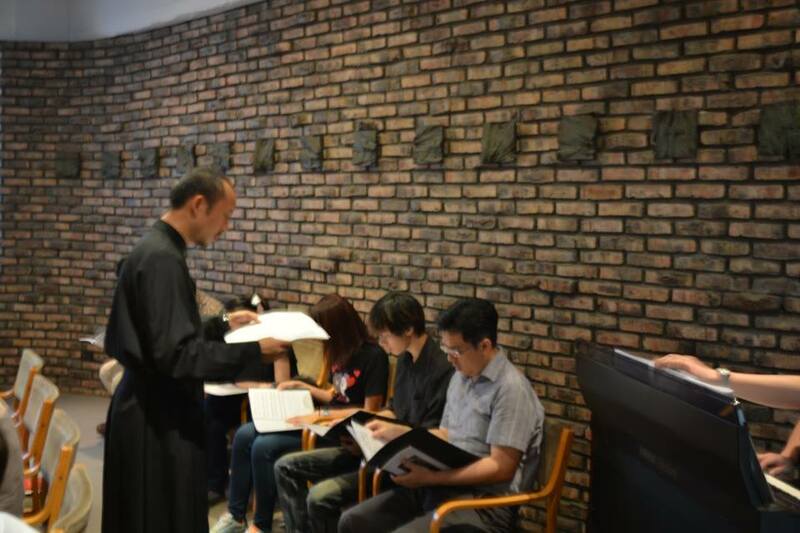 We received this message a few days ago from the Latin Mass group of Taiwan, which has been formed under the auspices of the Diocese of Hsinchu and the Shrine Parish of Our Lady of Mt. Carmel, which is served by the Discalced Carmelite Friars. “We are happy to share our humble beginnings in reviving the TLM with our first Missa Cantata on the Fourth Sunday after the Pentecost, celebrated at Fujen Catholic University, SVD Chapel. The celebrant was Rev. Fr. Jerome Guevara, SJ, who is one of the chaplains of CMLT. The choir was the Fujen Catholic University Music Studies Department, directed by Prof. Pan Tien-ming and Prof. Lionel Hong. We are having our regular Mass monthly usually every third Saturday of the month at 4:30 pm. Since we mentioned the 1000th anniversary of the death of St Vladimir last week, it seems fitting to say a bit about his sons Ss Boris and Gleb, whose feast day is today. 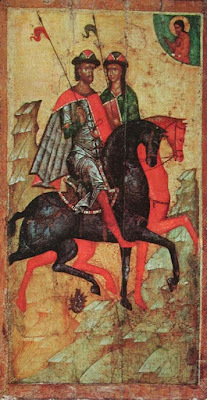 Ss Boris and Gleb, depicted in a famous icon painted about 1340, now in the Tretyakov Gallery in Moscow. The deaths of the two princes took place very shortly after their father’s death in 1015. 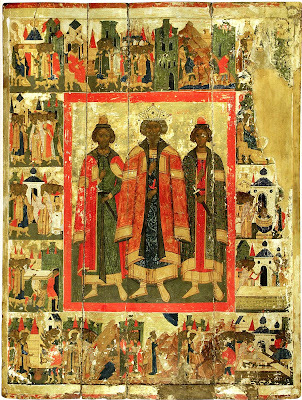 When Yaroslav had secured the throne five years later, Sviatpolk being now defeated and dead, he had the incorrupt bodies of his slain brothers brought to the church of St Basil in the town of Vyshgorod, the royal residence close to Kiev. The tomb at once became a place of pilgrimage, and the site of many miracles, such that Yaroslav asked the Church to formally recognize them as Saints. The metropolitan of Kiev (a Greek, since the hierarchy had only just been established out of Constantinople) was skeptical; Boris and Gleb were not martyrs, since they had not died for the Faith, nor were they ascetics, or bishops, or great teachers. 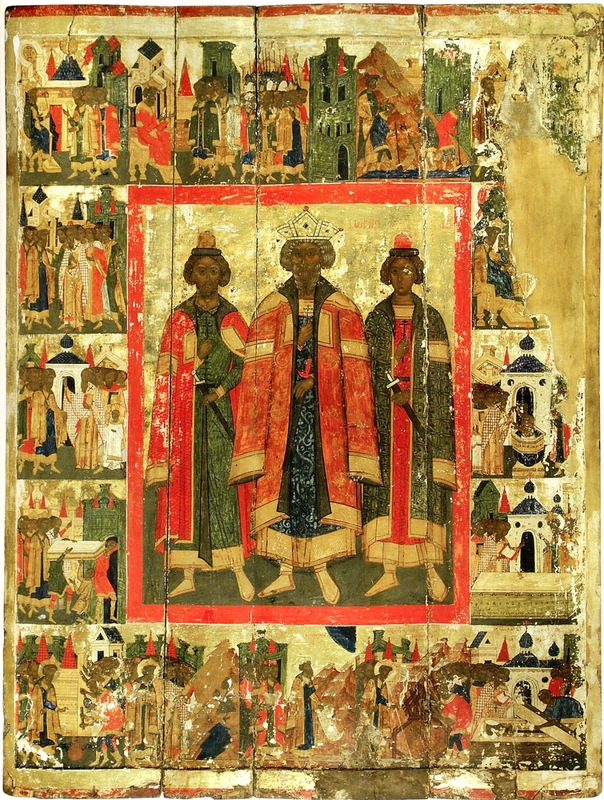 But popular devotion would not be denied, and the brothers were officially recognized as the first of a new category of Saint, called “Passion-bearers” (страстотéрпецъ in Old Church Slavonic, ‘strastoterpets’); that is, Saints who, in imitation of Christ’s humility, have accepted suffering and death, even where they might have resisted it justly, for the sake of His name. By the end of the eleventh century, devotion to them had reached even to Constantinople itself, and an icon of them was exposed in Hagia Sophia. Prince Igor of Kiev and Chernigov, a great-grandson of Yaroslav the Wise who was murdered in another round of dynastic struggles in the following century, is also called a Passion-bearer. 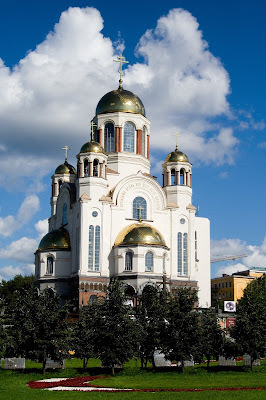 More recently, the title has been accorded by the Russian Orthodox Church to the seven members of the Imperial family who were murdered by the Bolsheviks on July 17, 1918, exactly one week before the feast of Ss Boris and Gleb. 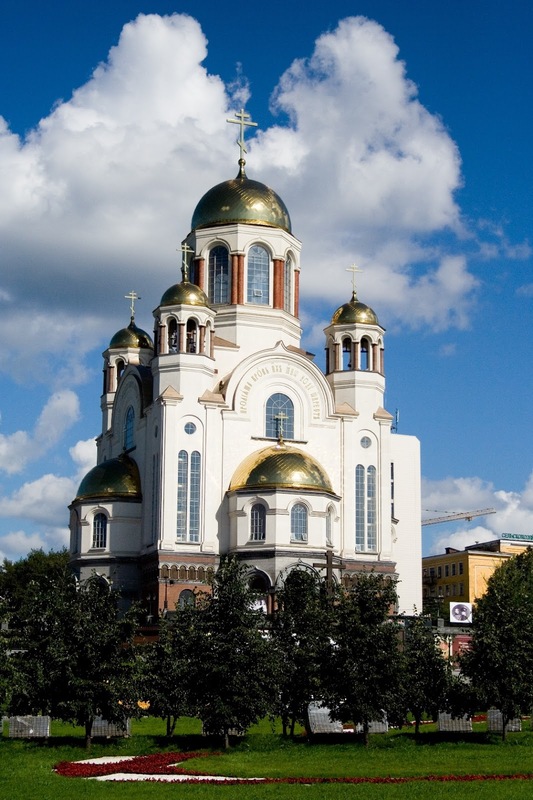 A church has been built in the city of Yekaterinburg over the site of their murder, called “the Church on the Blood”, but their relics are interred in the cathedral of Ss Peter and Paul in St Petersburg. Sadly, the relics of Ss Boris and Gleb were lost when the church of St Basil in Vyshgorod was destroyed by Mongol invaders in 1240. O Passion-bearers and fulfillers of the Gospel of Christ, chaste Boris and guileless Gleb: you did not oppose the attacks of the enemy, your brother, when he killed your bodies, but could not touch your souls. Let him therefore mourn, while you rejoice with the Angels, standing before the Holy Trinity. Pray that those who honor your memory may find grace with God, and that all orthodox people may be saved. Today your memory shines forth, noble sufferers, and summons us to glorify Christ our God. 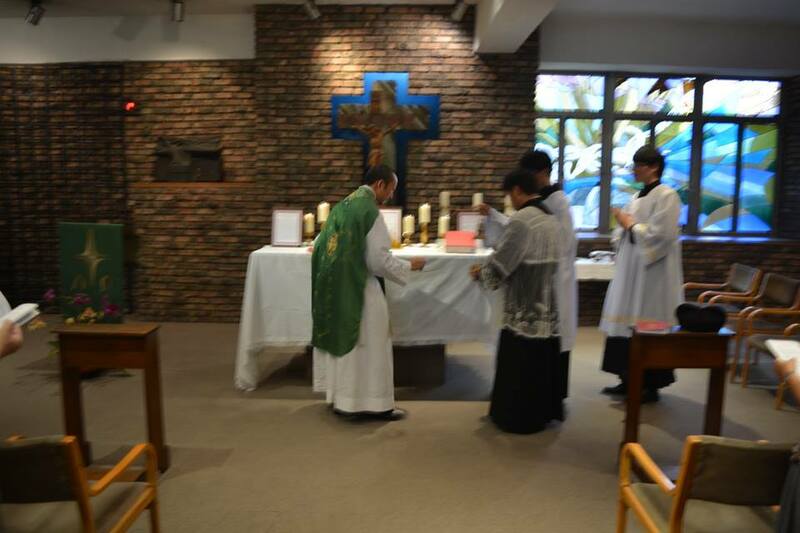 Those who come to the shrine of your relics receive healing through your prayers, for you are holy physicians. One of the many lovely churches in the city of New York, The Church of Our Savior, had a number of beautiful icons ornamenting the sanctuary, placed there by a previous pastor, Father George Rutler, who had them commissioned by Ken Woo, a New York artist, between 2004-2010. In a post on July 22 on the Parish’s facebook page, Fr. Robbins said that these changes were being made in an effort to restore the parish to the original construction design of the church. 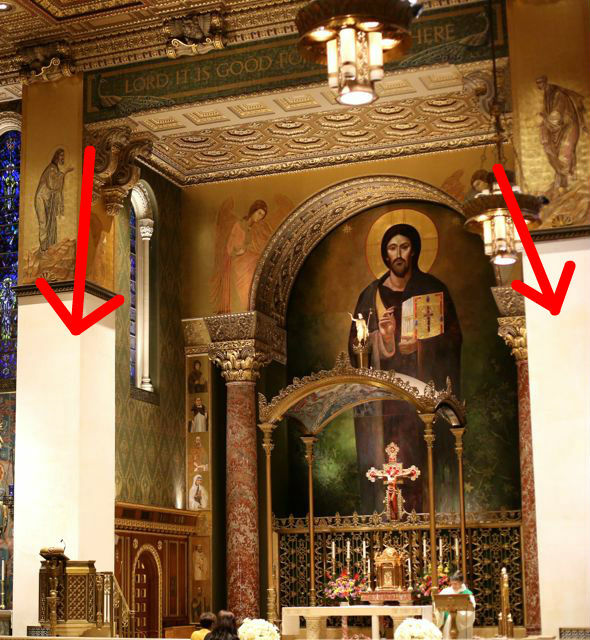 To date, 23 of the 30 icons have been removed, with the large Christ Pantocrator still behind the altar. According to multiple sources, the Pantocrator icon is slated for removal as well, only 10 years after being put in. When originally installed, it was not an innovation, but a replacement for a crumbling acrylic mural on canvas from the 1950s. 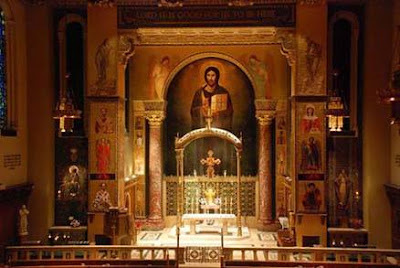 The icons, therefore, were an improvement from the state of the sanctuary in 2005 before they were added. 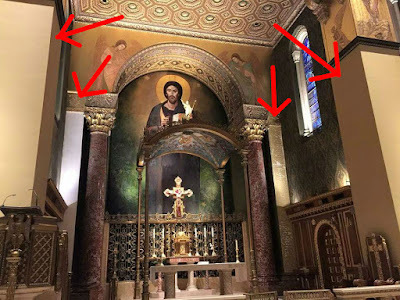 However, it may be noted that there have been no plans to move the freestanding altar to its original location in the church for exclusively ad orientem worship. It is also worth noting that the artist was not consulted in the process of these renovations. The parish responded to our inquiries without comment. We submitted a written inquiry for information about the project to the Archdiocese of New York, but thus far have had no reply. When and if we do hear from them, we will update this post with any appropriate information. The pictures below show the progression of the removal of icons. Those who plan on participating in the Populus Summorum Pontificum pilgrimage to Rome this year, from October 22-25, will not only be able to attend the traditional liturgy in St Peter’s Basilica and some other very beautiful churches. They will also hear that liturgy sung by one of the finest sacred choirs in the world, the Schola Sainte Cécile, formed by parishioners of Saint-Eugène in Paris, where the traditional liturgy has been the order of the day since 1985 alongside the modern liturgy, and directed by our own Henri Adam de Villiers. In this interview, which is also being published on the website Paix Liturgique in French, Henri presents the rich musical program which the Schola will sing at the various liturgies of the pilgrimage this year. We are very grateful to Mr Guillaume Ferluc, one of the most active organizers of the pilgrimage, for sharing the interview with us and providing this translation. Maestro de Villiers (second from right) leading one of the three choirs at Vespers at Trinità dei Pellegrini, during the 2013 Summorum Pontificum pilgrimage. The choir was split into three parts, each in one of the church’s three choir lofts, (one at the back, and one on either side of the sanctuary), which took turns singing alternate verses of the various parts of Vespers, a technique known as “cori spezzati - broken choirs.” (see below under question 2.) I was present for this liturgy, and it was one of the most beautiful I have ever heard. 1) Good morning, Henri! For the second time since 2013, the Schola Sainte Cécile comes to Rome with the Summorum Pontificum pilgrimage. What explains this loyalty? HAV: It is an honor, and at the same time a great joy, for us to come back to Rome with the Summorum Pontificum pilgrimage. It’s an honor because this international pilgrimage gathers many faithful from the four corners of the world who are coming to give thanks to God at the See of Peter. By participating in this pilgrimage, the faithful are coming to show how the traditional liturgy is a path of conversion and nourishment for their lives as Christians. That means that we have to give the best of ourselves to make the offices and the Masses even more beautiful and magnificent, more “extraordinary” than they ordinarily are the rest of the year! It is also a great joy because singing in the chief places of our Catholic faith is, quite frankly, deeply moving. I remember being on the verge of tears two years ago in the Vatican Basilica: that’s how intense the feeling was, singing the holy Mass near St. Peter’s tomb. 2) Would you tell us the program you are going to present during the pilgrimage? HAV: Gregorian chant will have pride of place, and of course it will be sung in toto at each of the Masses where we’ll be singing, as is our usual practice. As for the polyphonic offerings, the program is unusual. We intend to take advantage of the several tribunes available in Roman churches to present works involving several choirs (as we had done two years ago) according to a technique called “cori spezzati,” i.e. “broken choirs”: the choristers take their places in several different tribunes and answer each other, sometimes quite dynamically, which produces stunning acoustical effects. 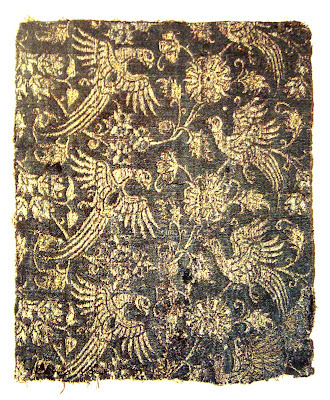 This use of “cori spezzati” flourished in Rome from the Renaissance to the end of the eighteenth century. That is how we shall sing Vespers and Benediction at Trinità dei Pellegrini, with three choirs, this 22 October. But it is especially during the Pontifical Mass on Friday October 23 that we will deploy this multiple-choir repertoire, taking advantage of the exceptional acoustics and numerous tribunes of the church of Santa Maria in Campitelli. That is where we will sing Antoine Charpentier’s Mass for 4 choirs (H.4), one of his masterpieces. It is rarely performed because of its difficulty: 16 real voices and instruments! There some indications that Charpentier may have composed this Mass while at Rome in his youth, for “Roman bargemen” (!). He unquestionably discovered this polychoral repertoire in the Eternal City: his manuscripts contain a copy of another four-choir Mass by a Roman composer, Francesco Beretta, who was the Vatican choirmaster and whom Charpentier would have met during his years of training in Rome. * Vox Domini by Eustache du Caurroy, choirmaster of French King Henry IV [reigned 1589-1610] and fervent promoter of multiple-choir polyphony in France. * Omnes gentes plaudite manibus by Guillaume Bouzignac (this will probably be the first time this eight-voice piece is performed since the seventeenth century). The acoustics at St. Peter’s of Rome, where we’ll have the joy of singing the Mass of Saint Raphael Archangel on 24 October, are more difficult, to be sure. Nevertheless, we will sing Angeli Archangeli, a great two-choir motet by Jean Veillor, choirmaster of Louis XIV during the latter’s minority, and the splendid Pange Lingua by Michel-Richard de Lalande, another of Louis XIV’s royal choirmasters. This year we will be accompanied by two sackbuts, the Renaissance and Baroque ancestor of the trombone. 3) The Schola is a choir made up of laymen, whose productions hold their own among professional choirs. What is the secret of your harmony? HAV: Why, there’s no mystery to it, really: we sing of God alone and for God alone, through the traditional liturgy. 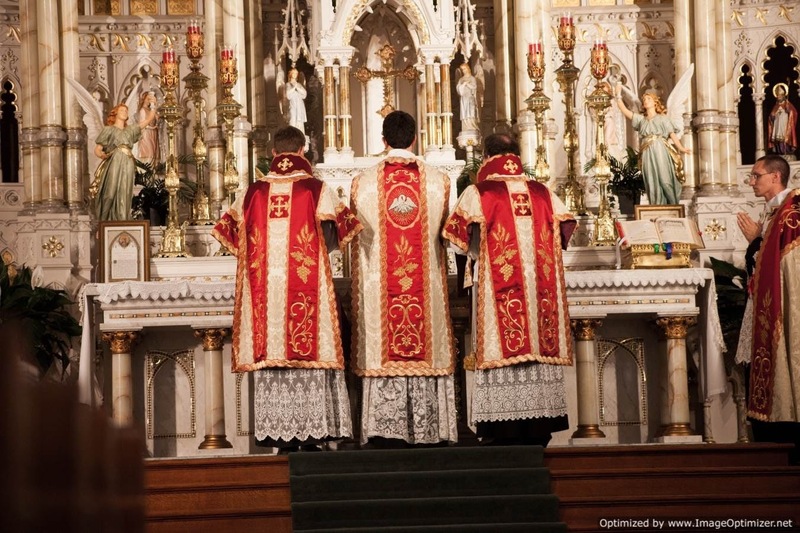 Now this liturgy is demanding: one cannot just do whatever, and personal subjectivity must take a back seat, because one must above all follow the path of a centuries-old tradition of sacred music. The traditional liturgy is demanding, but that also means that it is a true school in excellence that draws us upwards and makes us give the best of ourselves. That is why this liturgy has begotten so many artistic wonders throughout history, not only in the realm of music, but also in the other arts, notably architecture. Rome is particularly well served in these wonders. 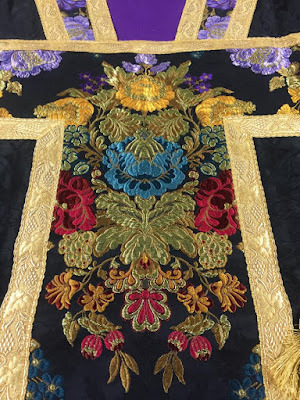 I believe that our choristers—who are only simple parishioners—are very sensitive to that aspect: their generous personal investment is an enthusiastic response that aims to measure up to the traditional liturgy’s inherent beauty. God is the Sovereign Good and the Sovereign Beautiful—and the liturgy is a foretaste of His glory, an epiphany, Heaven on earth! So mediocrity can’t be allowed! 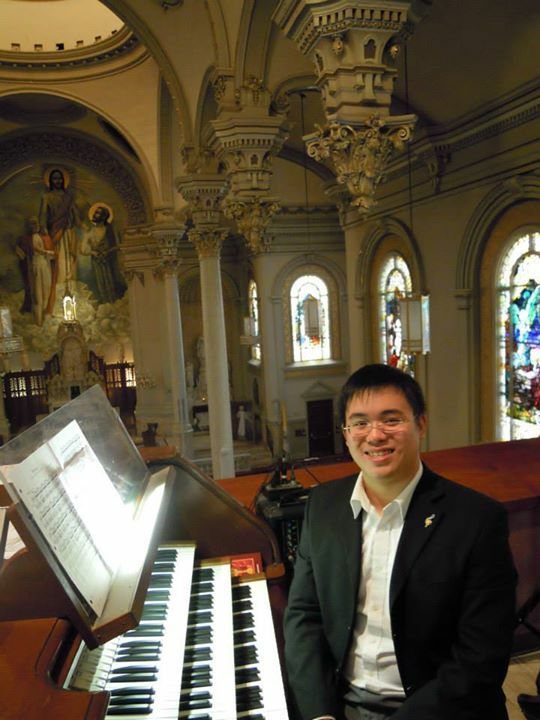 My work as director at the Schola Saint Cécile has above all consisted in schooling myself in the great tradition of western sacred music, which itself can only be fully grasped by a good knowledge of the liturgical and musical tradition of the Christian East. We have the joy of performing works from the great repertory of western sacred music in the exact setting for which they were created, whereas most often they are only heard at concerts. When they are ordered to their true end, which is to glorify God, these works fully take on their whole meaning, whereas they are tragically cut off from their true dimension when they are heard in any setting but the liturgy. 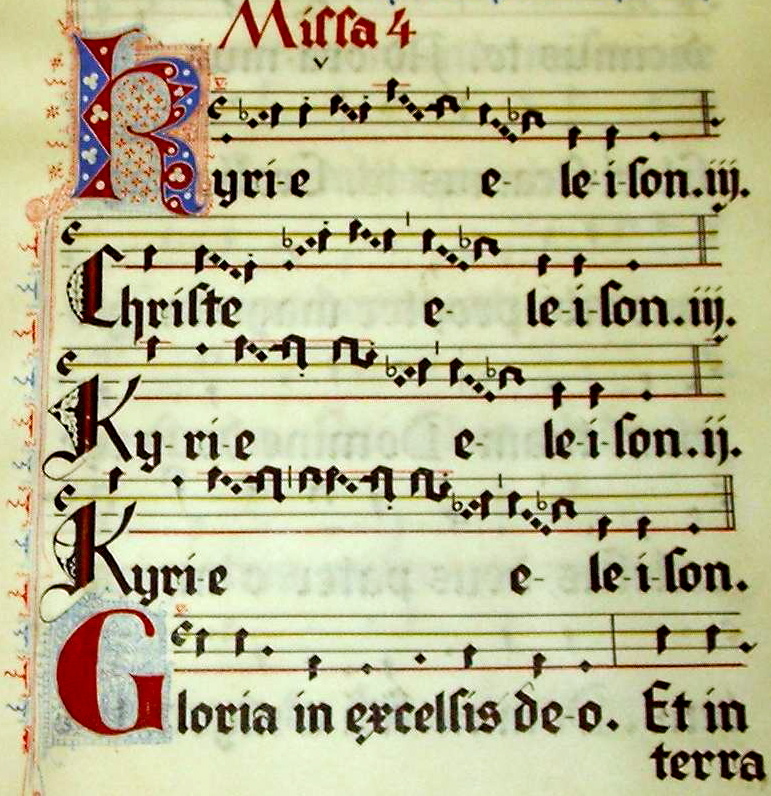 We bring back to life marvelous forgotten works that are otherwise sleeping in the public library stacks, and we regularly stage original liturgical projects, such as singing the Mozarabic rite in Toledo or the Ambrosian rite in Milan. This can only motivate our choristers! Lastly, I believe that making music together forms deep personal bonds. And singing for the Lord adds an extra dimension, a dimension of spiritual communion: we share a whole lot more than musical notes! From the Grandes Heures d’Anne de Bretagne (The Great Hours of Anne of Brittany), made by Jean Bourdichon, 1503-8, for Anne, Duchess of Brittany and Queen of France (1477-1514), and considered to be one of the finest illuminated Books of Hour ever made. 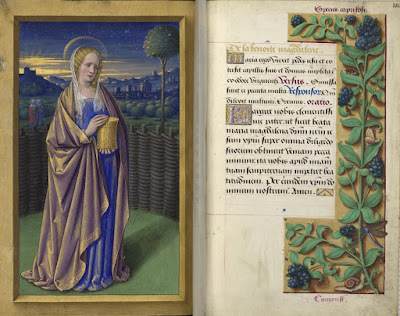 These two leaves come from the part of a book of Hours known as the Suffrages, a series of commemorations of the Saints, each consisting of an antiphon from that Saint’s Office, a versicle and respond, and the prayer. Here we see St Mary Magdalene before she meets the risen Christ on Easter morning, with tears on her face, holding the jar of ointments which she has brought to anoint His body; in the background, the other two Marys are shown in a similar attitude. Particularly striking is the representation of the earliest moments of sunrise behind the city of Jerusalem on the left, while the stars are still seen in the night sky above. Antiphona: María ergo unxit pedes Jesu, et extersit capillis suis, et domus impléta est ex odóre unguenti. - Therefore Mary anointed Jesus’ feet, and wiped them with her hair, and the house was filled with the scent of the ointment. V. Dimissa sunt ei peccáta multa - Many sins are forgiven her. R. Quoniam dilexit multum. - Because she hath loved much. 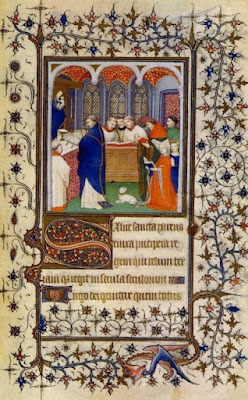 The Great Hours of Anne of Brittany can be seen in full on the website of the Bibliothèque National de France. 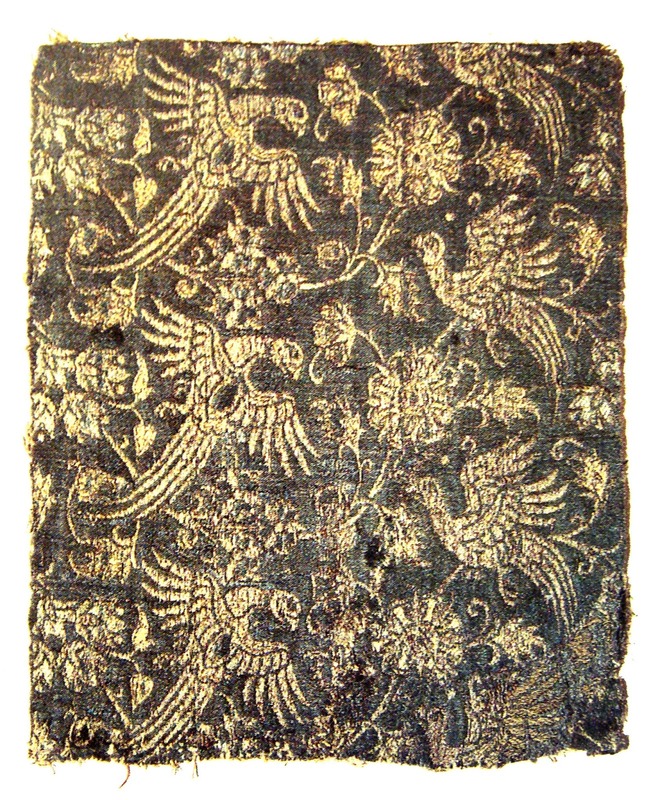 In addition to the liturgical texts and the very large number of sacred illustrations of the highest quality, they are also remarkable for the decorative borders; these show a great variety of plants and flowers, and small animals of every kind, all labelled in Latin, and painted with a really impressive degree of realism. Just a brief notice that today, July 21, 2015, is the 500th anniversary of the birth of St Philip Neri. Although St Philip spent most of his life in Rome, moving there when he was 18, and there founded the Congregation of the Oratory, he was actually a Florentine. His lifelong attachment to and friendship with the Dominicans was formed in the city of his birth, at their church of San Marco, (which is likely to close soon.) Our best wishes and prayers to all of the Oratorian houses and their members throughout the world on this auspicious day! Today is the feast of St Lawrence of Brindisi, who was born on the feast of St Mary Magdalene in 1559, and died on the same day at the age of sixty in 1619. Although his family was Venetian, he was born in the major port city of Brindisi, then in the Kingdom of Naples, far down Italy’s Adriatic coast. After entering the Capuchins at the age of 16, he studied at the University of Padua, then the major university of the Venetian Republic, and showed a remarkable facility for languages, learning several modern ones in addition to the languages of the Bible. He was instrumental in establishing the Capuchin Order, then still a fairly new branch of the Franciscans, in Germany as a bulwark against the further spread of Protestantism, but also in rallying the German princes against the Ottoman Turks. He was chaplain to the army, which he helped to organize, stirred to attack with a rousing address, and led in battle armed only with a crucifix in his hand. Despite these and many other activities, including a period as the head of his Order, and despite the extreme austerity of Capuchin life and the full round of liturgical and devotional prayer, St Lawrence also found time to write hundreds of sermons, almost all in Latin, covering a very wide variety of topics, as well as a commentary on Genesis and some writings against Lutheranism. As is noted in the revised Butler’s Lives of the Saints, when these writings were examined during his canonization process, it was said that “Indeed, he is fit to be included among the holy doctors of the Church.” This honor was bestowed upon him by Pope St John XXIII in 1959, the fourth centennial year of his birth, making him the 30th Doctor of the Church. There will be a Summer Sacred Music Workshop in Georgia, to be be held at Our Lady of the Mountains Roman Catholic Church in Jasper, GA, on August 15, 2015. This one-day workshop is open to anyone who is interested Sacred Music. 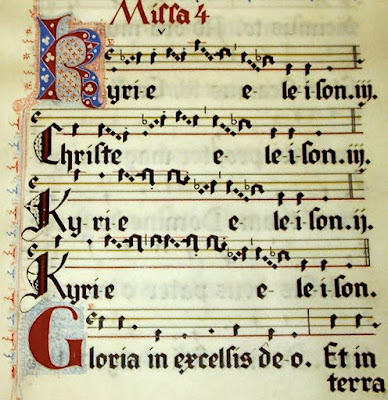 This is an opportunity for musicians in the Southeast area (Georgia, Alabama, Tennessee, South Carolina and North Carolina) to learn about the Ancient Gregorian Chant and Classical Polyphony. Fr. David Carter, JCL, will be giving the keynote entitled, Re-discovery of the Church’s Sacred Tradition: II Kings 22. The deadline to register for the workshop is August 1. In the liturgical Calendar of the Byzantine Rite, and in the two Carmelite Orders, July 20th is the feast of the Prophet Elijah. The Eastern tradition keeps almost all of the Prophets as Saints, and honors them as such in the liturgy. Veneration of Saints of the Old Testament is hardly known to the West, however, and where it is observed in the Latin rites, it arose under Eastern influence. 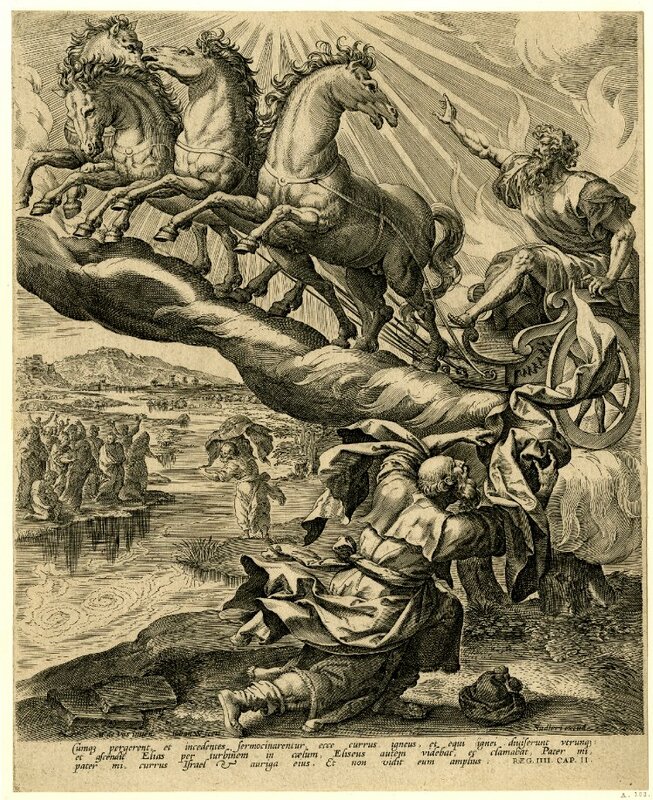 The Carmelites, who came into existence as an Order in the Holy Land, honor Elijah as their founder, and keep his day as one of their patronal feasts, along with that of his disciple Elisha, on June 14th. A facebook page which I check daily, Byzantinegallery, posted a photo today of this extraordinary icon of the Ascension of the Prophet Elijah, from the website of the Byzantine and Christian Museum in Athens. The engraving by Jan Wierix, from the website of the British Museum. 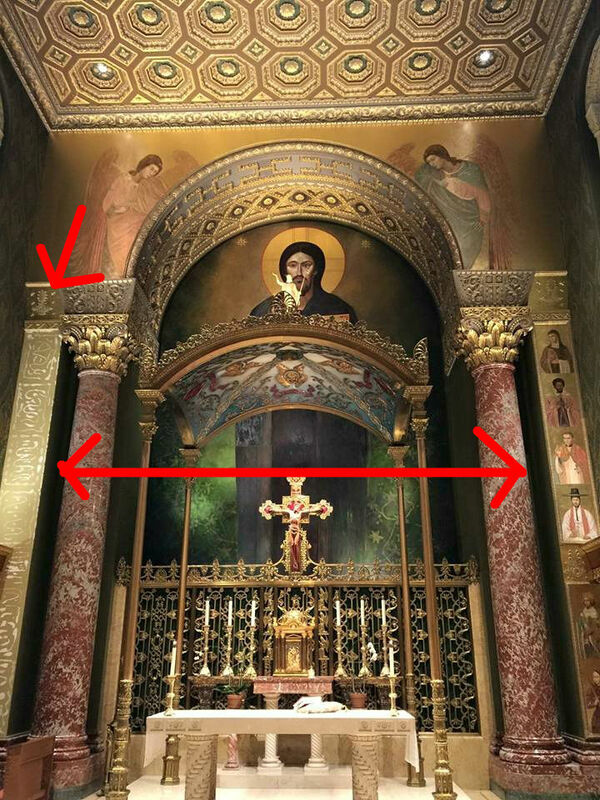 In the lower right of the central band, the patron who commissioned the work, a priest and monk named Sophronios Faskomelosis, identified by the inscription in front of him, kneels in prayer; on the opposite side is the city of Jerusalem. In the other bands are shown other episodes from the life of Elijah; at the upper left are three episodes from 3 Kings 17, where he first appears in the Bible, conversing with the widow at Sarephta, receiving food from a raven, and raising the widow’s son from the dead. In the lower band, the prophet defeats and slaughters the prophets of the idol Baal (chapter 18), and destroys the soldiers of the wicked King Ahab sent to apprehend him. All of the episodes depicted in this icon are traditionally read at Vespers of the Prophet Elijah in the Byzantine Rite. The artist’s signature is given at the lower left. From Vespers of the Prophet Elijah: The one hallowed before his conception, the Angel embodied, the mind of fire, the man of heaven, the godlike forerunner of the second coming of Christ. the glorious Elias, the foundation of the Prophets has spiritually invited all lovers of festivals to celebrate his godly memory. At his intercessions guard your people, O Christ God, untroubled from every kind of harm of the trickster. St. Thomas Aquinas discusses at some length the place, time, location, words, and ceremonies of the Mass and their fittingness in the Summa theologiae, Tertia Pars, question 83. This text is, of course, magnificent and mature, characteristic of the final years of the saint’s life and theological labors, and is highly recommended reading for all Catholics who are serious about living the vita liturgica. You will certainly learn things from this question that you never knew before, even if you already consume a steady diet of books or blogs on liturgy. 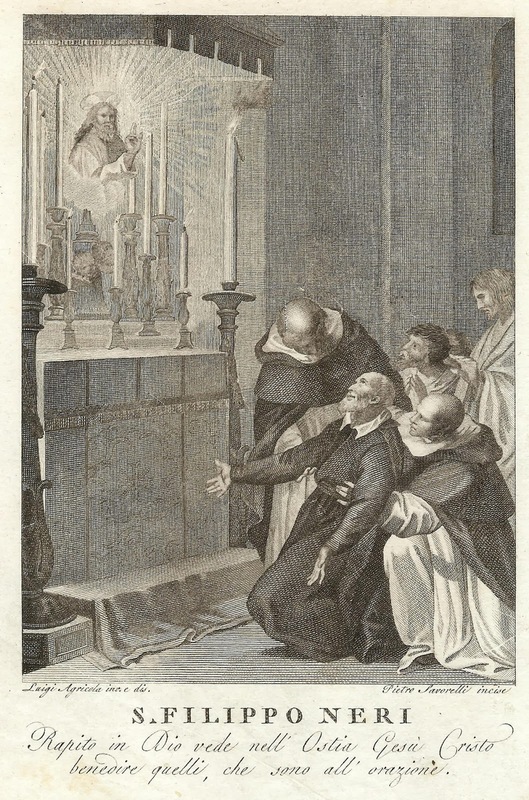 Less well known, however, is an exposition of the Mass that Thomas as a young friar and prospective university teacher gave his Parisian audience at the end of Distinction 8 of Book IV of his Commentary on the Sentences of Peter Lombard. Here follows this fine text of the Angelic Doctor, in its first complete translation in English, thanks to Dr. Beth Mortensen of The Aquinas Institute for the Study of Sacred Doctrine. As part of its long-term Opera Omnia project, of which 17 volumes are currently in print and 9 more are in the works (see here for an update), the Aquinas Institute is in the midst of a three-year NEH project to publish a bilingual annotated translation of Book IV of Aquinas's Commentary on the Sentences. Paragraph numbers have been added for the reader’s convenience. By all the rest of the things that are said, praise is given to God. 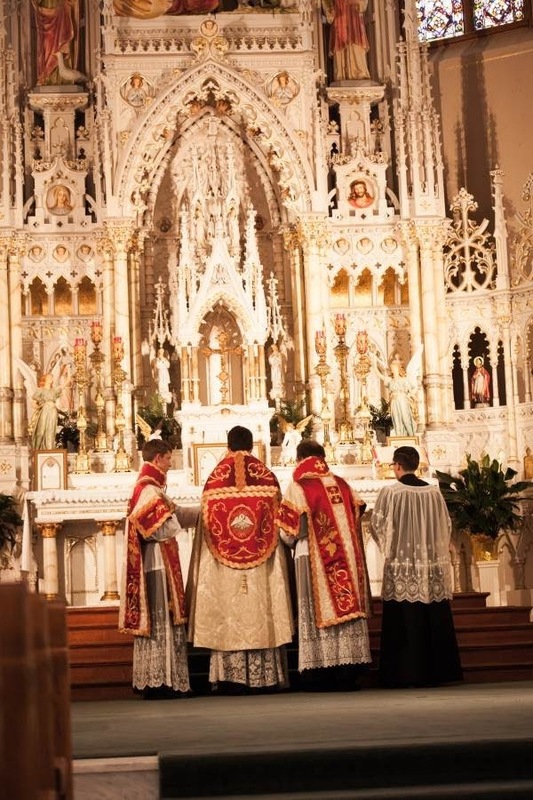 It should be known that of those things that are said in the office of the Mass, some are said by the priest, some by the ministers, and some by the whole choir. Those indeed by which the people is directly ordered to God are only the ones said by the priests, who are the mediators between the people and God. And some of the priest’s words are said publically, regarding the whole people, in the person of whom he alone speaks them to God, like prayers and thanksgiving. But some are said privately, which regard only his own office, like consecrations and prayers of the sort that he does for the people, but not praying in the person of the people. Nevertheless when he is praying in the person of the people he also prefaces all his words with, The Lord be with you, so that the minds of the people may be united with him by a right intention. And since the people have the priest as their leader in that which is directed to God, for this reason at the end of every prayer the people consent by answering Amen; and this is also why every prayer of the priest ends aloud, even if it is done privately. Now for those things that are divinely handed down through the minister to others, the people are directed by the ministers of the altar. But those things that pertain to disposing the people, the choir accomplishes: of these, the ones that pertain to those things that surpass human reason, are started by the priest, as though divinely received; the ones that are consonant with reason are declared by the choir by itself. Likewise some pertain to the people as preparatory to receiving divine things; and these are said by the choir before those that are said by the ministers and priest. But some things are caused by the reception of divine things in the people, and these follow what the priest says. Therefore, having seen these things, it should be known that since all our activity is begun by God, it should likewise end in him, coming full circle. And this is why the office of the Mass begins from a prayer and ends in thanksgiving. Hence it has three principal parts: namely, the beginning of the prayer that lasts until the epistle [Part I]; the middle celebration itself that lasts until the postcommunion [Part II]; and the end of thanksgiving from there until the end [Part III]. The first part contains two things, namely, the preparation of the people for prayer, and the prayer itself. Now the people are prepared for prayer in three ways. The first is by devotion, which is aroused in the Introit; hence it is also received by something pertaining to the solemnity, in the devotion of which the people are brought together, and the psalm is also added. Second, humility, which is done by the Kyrie eleison, for the one seeking mercy declares his wretchedness; and it is said nine times because of the nine choirs of angels, or because of faith in the Trinity, according as any Person is considered in himself and in relation to the other two. Third, by right intention, which is directed to the heavenly fatherland and glory, which exceeds all human reason; and this is done by the Glory to God in the highest, which the choir completes once the priest has started it. And so it is only said on solemnities which represent to us heavenly solemnity; but in the offices of grief it is completely omitted. Next comes the prayer poured out to God for the people, which the priest publically pronounces after The Lord be with you; it is taken from Ruth 2:4. However, the high priest says: Peace be with you, bearing the type of Christ who addressed his disciples with these words after the resurrection, in John 20:19 and 21. But the second main part contains three parts. 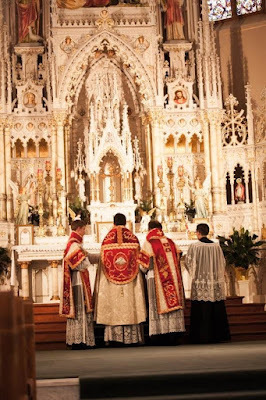 The first is the instruction of the people until the offertory; the second, the offering of the matter until the Preface; the third, the consummation of the sacrament until the postcommunion. The instruction of the people is done through the word of God, which indeed reaches the people from God through his ministers; and so those things that pertain to the instruction of the people are not said by the priest, but by the ministers. There are three kinds of ministry of the word of God. The first is from authority, which belongs to Christ who is called ‘minister’ in Romans 15:8, of whom it is said, but he was teaching as one having power (Matt 7:29). The second is from the truth made plain which applies to the preachers of the New Testament, of whom it says, he has made us also worthy ministers, etc. (2 Cor 3:6). The third is from prefiguration, which applies to the preachers of the Old Testament, and this is why the deacon sets down Christ’s teaching. And since Christ is not only man, but God, for this reason the deacon says first, The Lord be with you, so that he might make men attentive to Christ as God. Now the teaching of the preachers of the New Testament is set down by subdeacons. Nor is it inconsistent that sometimes in place of an epistle something is read by them from the Old Testament, since the preachers of the New Testament also preached the Old. 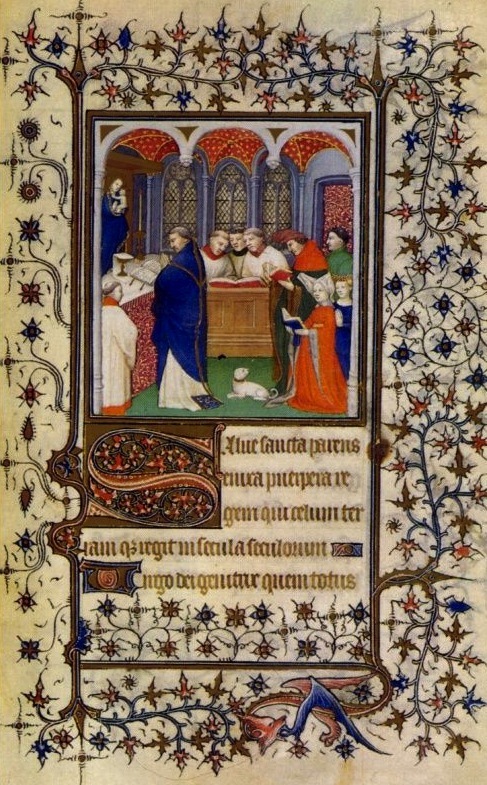 But the teaching of the preachers of the Old Testament is not always read by lower ministers, but for those days in which the configuration of the New and Old Testaments is especially indicated, like in the four fasting times of the year, and when certain things are celebrated that were prefigured in the Old Law, like the Passion, Christmas, the Baptism, and things like that. And since either teaching is directed to Christ, both of those who went before, and of those who came after, this is why the teaching of Christ is reserved for the end. However, from the teaching that is directed to Christ, two effects come forth for the people, by which also man is prepared for Christ’s teaching: namely, the progress of the virtues, which is suggested by the Gradual, for it is named from the step by which one ascends from one virtue to another, or from the steps of the altar before which it is said; and the exultation possessed from the hope of eternal things, which the Alleluia suggests; hence it is also repeated because of the stole of the soul and body. But on days and in offices of grieving it is omitted, and a Tract is put in its place, which by the harshness of voices and verbiosity of words suggests our residence in this present misery. However, during Eastertide, two alleluias are said because of the joy of the resurrection of head and of the members. But the effect of Gospel teaching is the confession of faith, which, since it is above reason, the Creed is begun by the priest and completed by the choir, nor is it said except for on those solemnities about which mention is made in the Creed, like the Nativity, the Resurrection, the apostles, who stood out as founders of the faith, as it says: like a skilled architect I have laid the foundation (1 Cor 3:10). Next comes the second part of the second main part, which pertains to the offering of the matter to be consecrated; and this contains three things. For the exultation of the ones offering it is stated first as preparatory to the offering, for God loves a cheerful giver (2 Cor 9:7). The offering itself is expressed when it is said, Receive, O Holy Trinity; the acceptance of the offering is said by prayers silently spoken, for it belongs to the priest alone to appease God by these offerings, for which prayer the priest prepares himself through humiliation, saying: humbled in spirit and contrite of heart may we find favor with you, O Lord. And since these three things named require that the mind be raised to God, this is why before all three is said, The Lord be with you (but in place of which is said Pray brethren when the prayer is to be said silently). The third part of the second main part, which pertains to the sacrament’s reception, contains three things. First, preparation; second, the sacrament’s completion, at: Therefore we humbly pray and beseech you, most merciful Father, etc. ; third, the consuming of the sacrament, at: Let us pray. At the Savior’s command and formed by divine institution, we dare to say. 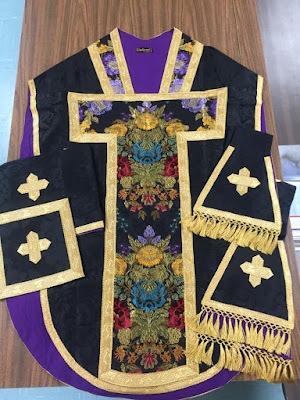 However, the preparation of the people, ministers, and priest for such a great sacrament is done by devout praise of God; therefore in the Preface, in which the preparation mentioned happens, three things are contained. First, the people’s arousal to praise, where the priest, having said The Lord be with you, which is to be referred to this entire third part, invites them to raise their minds, saying: Lift up your hearts, and to thanksgiving, saying: Let us give thanks to the Lord our God. Second, he implores God to receive our praise, showing that praise is due, saying: Truly it is worthy, by reason of his dominion (hence he adds, Holy Lord), and just, because of his fatherhood (hence he adds: all-powerful Father); right, because of his deity (hence he adds, eternal God); and for our salvation, because of our redemption (hence he adds: through Christ our Lord). But sometimes some other matter of praise is added suited to the solemnity, e.g., and to praise you in the assumption of Blessed Mary, ever Virgin; also setting forth an example of praise, through whom the angels praise your majesty. Third, the people offer up praises of the divinity, taking up the words of the angels: Holy, holy, holy, Lord God of hosts (Isa 6:3); and of Christ’s humanity, taking up the words of the children: Blessed is he who comes in the name of the Lord (Matt 21:9). However, the part that contains the sacrament’s completion is divided in three, according to the three things that are integral to this sacrament: namely, what is the sacrament alone; what is the reality-and-sacrament; and what is the reality alone. In the first part, therefore, is contained the blessing of the matter offered, which is the sacrament alone; in the second part, the consecration of the body and blood of Christ, which is the reality-and-sacrament, at: bless and approve this our offering; in the third, the request of the sacrament’s effect, which is the reality alone, at: vouchsafe to look upon them with a gracious and tranquil countenance. Concerning the first, the priest does two things: first, he asks a blessing on the offering, which is called a gift from God having given it to us, a present as something offered to God by us, a sacrifice as something sanctified by God for our salvation. Second, he asks salvation for the ones offering it, or for whom it is offered, at: which we offer up to you in the first place, etc. There he does three things. First he commemorates those for whose benefit the victim is offered: for the general state of the Church, as well as for particular persons, at: Remember your servants. Second, he commemorates those in whose reverence it is offered, at: in union with the whole church, and the Virgin who offered Christ in the temple is included, the apostles who handed down this rite of offering to us, and the martyrs who offered themselves to God, but not confessors, because in ancient times the Church did not invoke them in solemnizing, or because they did not suffer like Christ, of whose Passion this sacrament is the memorial. Third, what is sought to be obtained by the offering of this victim is expressly concluded, at: accept this offering, etc. Deign to make this our offering blessed, approved, etc. This part belongs to the consecration, which contains three things: first, the power of consecrating is implored; second, the consecration is completed, at: who the day before he suffered, took the bread; third, the commemoration of the thing consecrated is explained, at: wherefore, calling to mind the blessed Passion, etc. However, the words that are said here: make this our offering blessed, approved, ratified, reasonable, acceptable, can be referred in one way to what is the reality contained in this sacrament, namely, Christ, who is the blessed victim free from any stain of sin; approved, i.e. prefigured by the figures of the Old Testament, and by divine predestination foreordained; ratified, because not transitory; reasonable, because of its suitability for appeasing; acceptable, because of its efficacy. In another way, it can be referred to the host itself, which is the sacrament only; which he asks it to be blessed, that God consecrate it; but that he confirm it as regards memory, approved, [and] as regards a fixed purpose, ratified, that he may accept it; reasonable, as regards the judgment of reason; acceptable, as regards something pleasing to the will. In a third way, it can be referred to the effect, hence he says, blessed, by which we are blessed; approved, by which we may be enrolled in heaven; ratified, by which we may be counted among Christ’s members; reasonable, by which we may be torn from all beastly sensuality; acceptable, by which we may be accepted by God. Vouchsafe to look upon them with a gracious and tranquil countenance. Here the priest asks for the effect of the sacrament; and first the effect of grace; second, the effect of glory, at: remember also your servants, Lord. Concerning the first he does two things: first he asks that the sacrament be received, which is the cause of grace; second, he asks that the gift of grace be given, at: we humbly pray and beseech you, the exposition of which will be given further on, at Distinction 13. However he first asks the effect of glory for those already dead, at: remember; second, for those still living, at: for us, though sinners. However, the Canon of the Mass is customarily completed by other prayers in Christ, at: through Christ our Lord, by whom this sacrament has its origin and as to its substance; hence he says, you create, because of the natural being; you sanctify, because of the sacrament’s being, and as to its power; hence he says, you give life, because of the effect of grace, which is the life of the soul; you bless, because of the increase of grace, and as to its operation, or use, hence he says: and bestow on us. Let us pray. At the Savior’s command and formed by divine institution, we dare to say. Here the reception of the sacrament is set down, before which is the general and specific preparation. The general preparation has three parts: for, first, the sacrament’s petition is set down in the Lord’s Prayer, in which is said, give us this day our daily bread; second, the expiation of those receiving through the prayer of the priest: deliver us, Lord, from all evil; third, the fulfillment of peace, at, The peace of the Lord be with you. For this is the sacrament of holiness and peace; and since the peace of Christ exceeds all the senses, for this reason the petition of peace is begun by the priest, when he says, The peace of the Lord be with you, and it is completed by the choir, when it says, Lamb of God. And in this way it finishes three things begun by the priest, namely, Glory to God in the highest, which pertains to hope; I believe in one God, which pertains to faith; and The peace of the Lord be with you, which pertains to charity. Now the people asks mercy in the removal of evil against the wretchedness of fault and punishment, and peace, in the accomplishment of all good; and for this the Lamb of God is said three times. However, the special preparation of the priest consuming happens throught he prayers he says privately: Lord, Jesus Christ, and whatever others there are. The third main part is the thanksgiving; and it contains two things: the calling to mind of the benefit received, in singing the antiphon after communion, and thanksgiving in prayer, which the priest carries out, so that the end of the Mass might correspond in likeness to the beginning. However, it should be known that in the office of the Mass where the Passion is represented, certain Greek words are contained, like kyrie eleison, i.e., Lord have mercy; and certain Hebrew words, like alleluia, i.e., praise God; Sabaoth, i.e. of hosts; hosanna, save I beg; amen, i.e. truly, or so be it: and certain Latin ones, which are evident. For the placard over the Cross of Christ was written in these three languages (Jn 19:20). 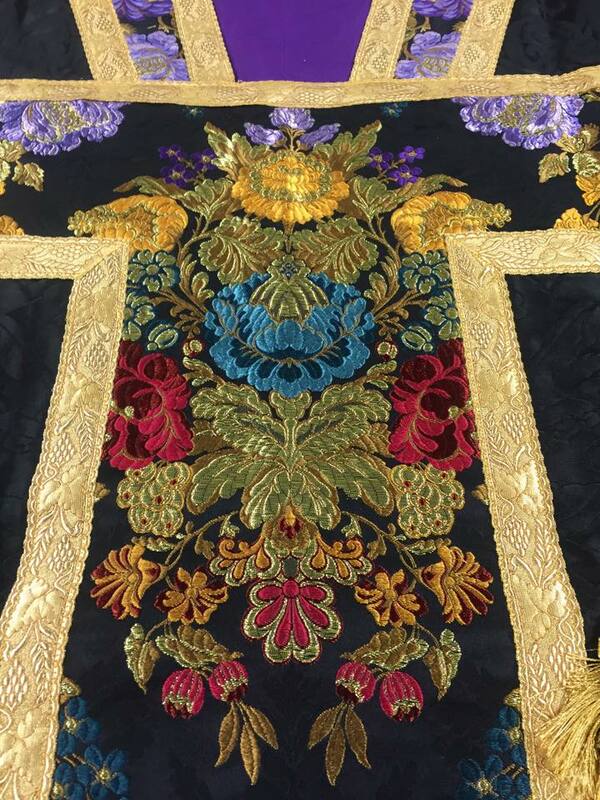 After seeing our post about St Camillus de Lellis, the founder of the congregation of Clerks Regular known as the Ministers of the Sick, on his OF feast day (July 14), a reader sent in this photograph of a relic of the Saint which he recently acquired. (Today is his EF feast day.) It is the form letter by which St Camillus, as the head of the order, grants to a member of the Congregation full rights to participate in all of its pious activities and exercises. The recipient was named Marcantonio Croce; St Camillus granted the same privileges to the man’s brother, Francesco Croce, as well, by adding his name on in the fifth line of the form letter, (the words represented below in italics.) 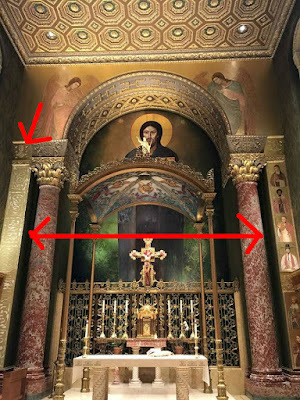 Technically, there are a few words within the document which, with the addition of the brother, should have been changed to the plural; there is also a typo in the last sentence, in which the word “meritorium” should be “meritorum.” St Camillus’ signature and seal are on the bottom. A full translation is given below; click the image to enlarge the picture. Camillus de Lellis, general prefect of the Order of the Ministers of the Infirm, to the most illustrious sir Marcantonio Croce, greetings (salutem) in Him who is the true salvation (salus). That which your perpetual will to persevere in our Order and your outstanding merits require, that with every sort of duty we should declare the charity and regard which we owe you in the Lord: since we can show this in no other matter than in spiritual services, inasmuch as our frailty can endure: in accordance with that authority which God has granted to us in this Congregation of ours; we make you and your brother the most illustrious sir Francesco Croce, your brother, a participant in all of the pious works, prayers, Holy Sacrifices, fasts, confessions, ministrations to the sick, visits to hospitals and prisons, (acts of) assistance to the dying, and finally of all pious exercises whatsoever, both of body and soul, which through the grace of God, take place in the whole of this Congregation, and grant to you a full share in these things, with full and sincere affection in our heart, in Christ Jesus. In the name of the Father and of the Son and of the Holy Spirit. Furthermore, we beseech God and the Father of our Lord Jesus Christ, that from the inexhaustible treasure of the merits of the same His most beloved Son, fulfilling that which lacks in us, may enrich you with the blessing of every grace in this life, and finally reward you with the crown of eternal glory. Given at Milan on the seventh day of the month of July, in the year of the Lord 1600. Camillus de Lellis. 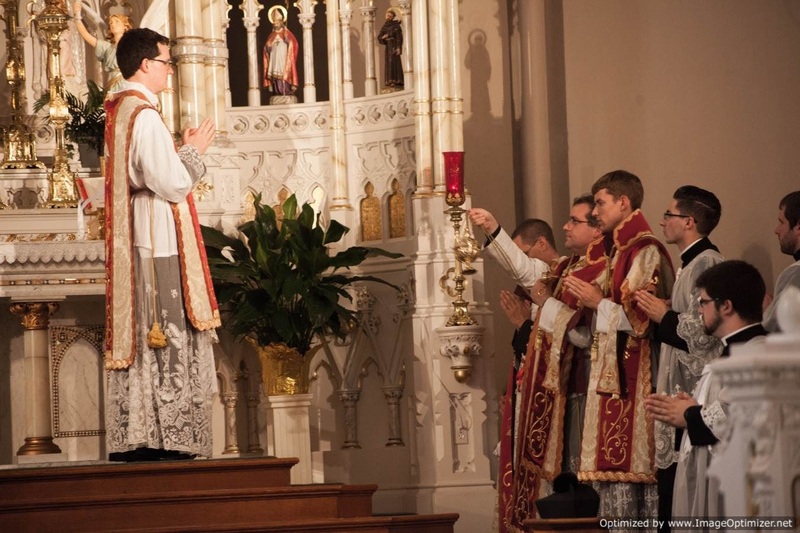 Our thanks and congratulations to Fr Royce Gregerson of the diocese of Fort Wayne - South Bend, Indiana, for sending in these photos from the Solemn High Mass which he celebrated on Corpus Christi, the day after his priestly ordination. The Mass was held at St Peter’s Church in Fort Wayne, and followed by a Eucharistic Procession. The vestments were produced from 2014–2015 by Arte Sacra Benedictus, a small artisanal vestment maker in Toledo, Spain, designed according to Fr Gregerson’s indications and modeled on an antique French set of vestments from the late 19th/early 20th century. 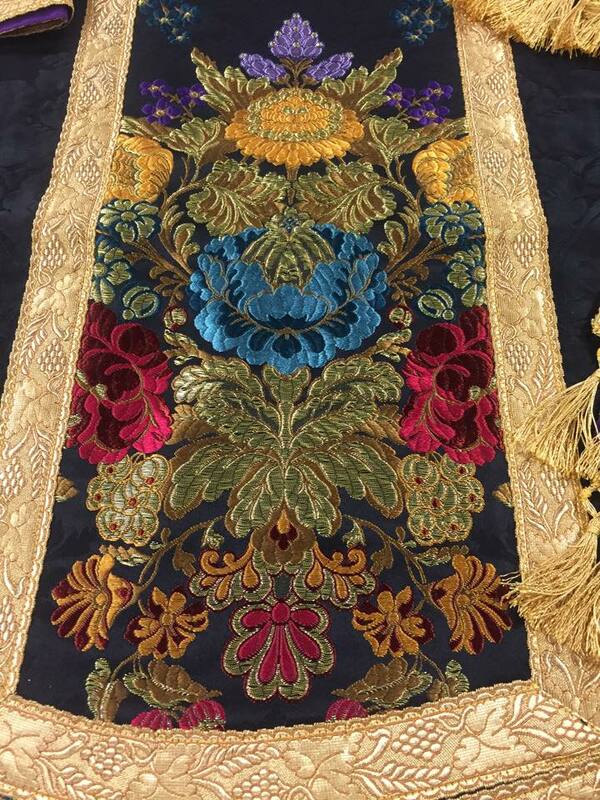 (Note the large collar on the dalmatic and tunicle, a classically Spanish embellishment.) The choir was composed of students from the University of Notre Dame, directed by Ms. Mary Catherine Levri, Assistant Director of the Liturgical Choir and Assistant Organist, Basilica of the Sacred Heart, Notre Dame. All photos by Anastassia; I here give just a small selection from the large album on googlephotos. Click here to see the rest.